As always, we’re launching out the fundraiser with some of our big guns: JoCo Cruise and Subterranean Press. The first gives you the chance to win a cabin for 2 on the nerdiest cruise ever. The second sends us beautifully produced, sometimes limited, often rare copies of amazing books. Last year was the first year we put something like this into the fundraiser, and it was awesome. 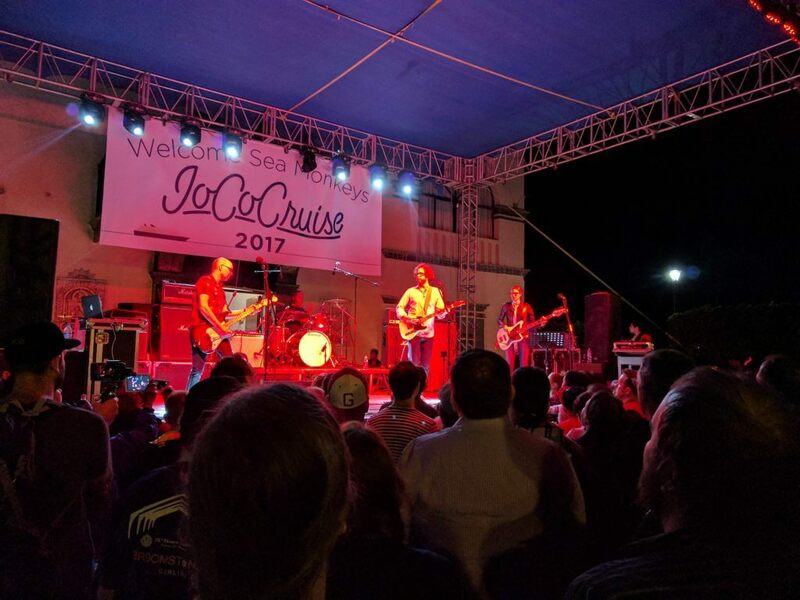 I’ve talked about JoCo Cruise on the blog recently. You can get the full scoop there. But in brief, let me say that JoCo cruise is one of my favorite parts of the year. I’ve made some of my best friends there. I snorkeled for the first time. I’ve learned about new music. Met cool comics writers, got to hang out with the folks who make Nightvale…. Also? I drank rum out of a Pinapple on a beach. Which is actually as much fun as it sounds. It’s everything I love about a convention, except it’s better. And on a boat. Plus there are extra things… like for example… We put on an entire music festival in Loreto…. So it is with no small amount of delight that I announce that JoCo Cruise has donated a posh balcony cabin for two to Worldbuilders. We’re putting it in the lottery where anyone who donates at least $10 has a chance to win it. You’ll still need to pay for your own flights to and from the cruise, but once you’re on the boat you’re pretty much golden. There’s free food and drinks (with some options you’d have to pay for), concerts, events, panels, and so, so much more all all included. 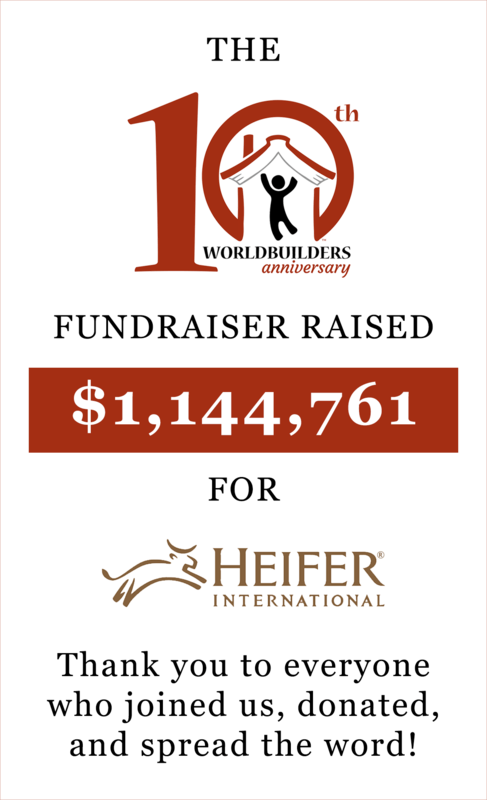 Since the beginning, the folks at Subterranean Press have been huge supporters of Worldbuilders. They’ve been in the business of producing beautiful, high-quality books for ages. They’ll bring old books out of print, and they’ll produce new books with awesome authors. They always send us well over a hundred books, some of which are limited, numbered, and signed. They sent us over $7,000 worth of books to add to the lottery, and they’re all beautiful. 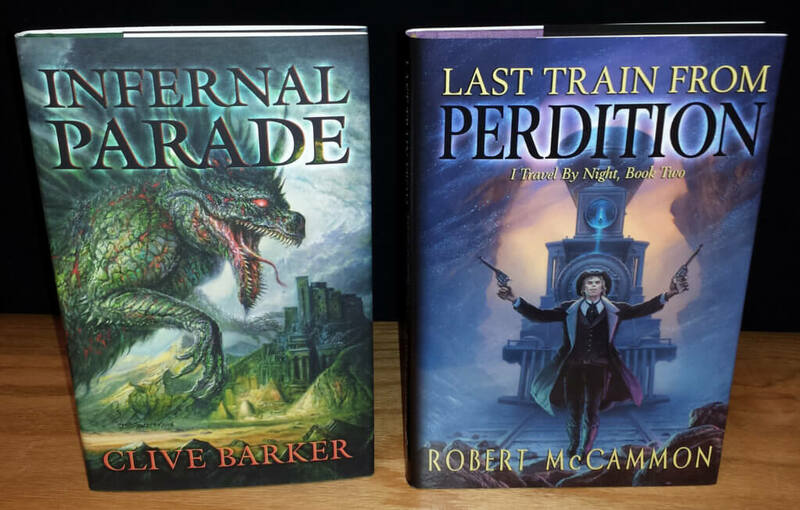 25 Copies each of Infernal Parade by Clive Barker and Last Train from Perdition by Robert McCammon. 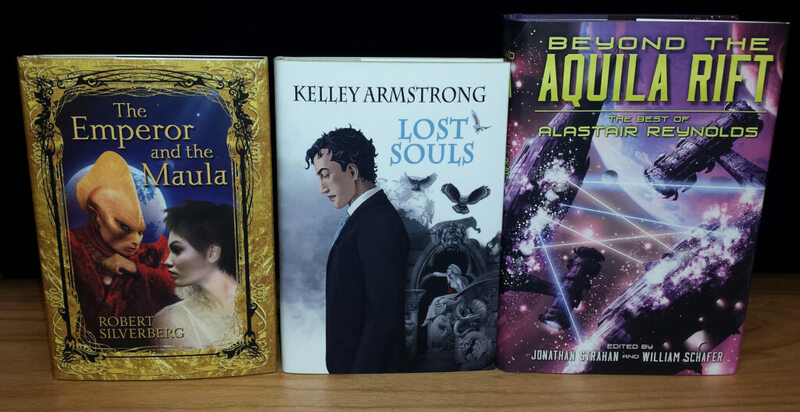 25 Copies each of The Emperor and the Maula by Robert Silverberg, Lost Souls by Kelley Armstrong, and Beyond the Aquila Rift: The Best of Alastair Reynolds by Alastair Reynolds. There’s lots of novels going into the lottery, but there’s also the opportunity to get some really great collections of stories from authors. It’s the perfect way to read someone new and get a good sense of their writing style, plus it’s a prize for doing awesome in the world. 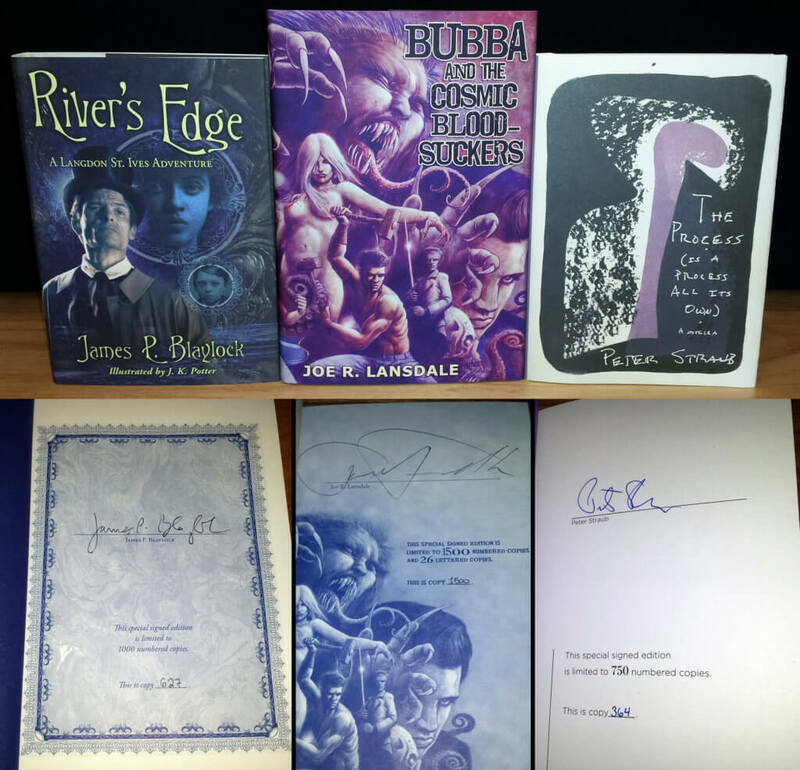 25 Numbered, Signed copies each of River’s Edge by James P. Blaylock and Bubba and the Cosmic Blood-Suckers by Joe R. Lansdale. 24 Numbered, Signed copies of The Process (is a Process All Its Own) by Peter Straub. Subterranean Press has truly beautiful limited editions of their books, and these three are no exception. All 74 of these books have specially designed signature pages where you can also see the number of the book, and all 74 are in the lottery. 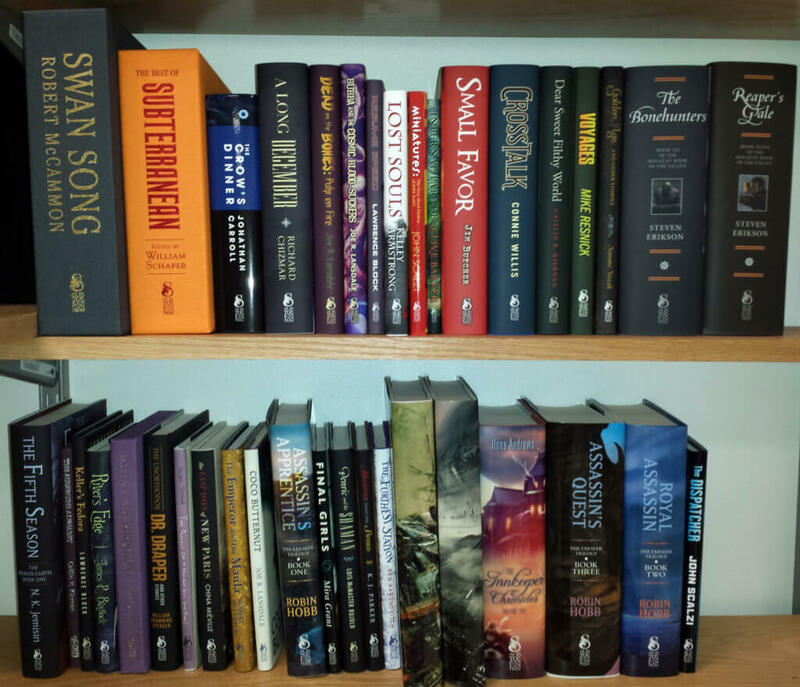 Auction: One of everything published in 2017 from Subterranean Press. This has become my new favorite tradition. Subterranean takes the time every year to set aside one copy of each book they publish, then sends us one massive prize that we get to put up for auction. All of these books had a fairly limited print run, and some are sold out. You can see the full list of everything included over in the auction listing, but the fact of the matter is it’s a lot of cool stuff. If you want it all to be yours, head over there and bid. Thank you for taking the time to come play with us. We’re so excited to do this, and we’re thankful to have such awesome supporters. There’s so many places to check out if you’re curious about the campaign. The first button is for the Hub Blog, where there’s links to every newly posted category of swag, the summary of how the lottery works, as well as any other information you may need about the fundraiser. It’s the perfect place to start. The second button will take you to the Worldbuilders Website, where you can also find many relevant links, check out all of our sponsors, find our FAQ, and more. The third button will take you where you need to get to DONATE as quickly as possible and participate in the lottery while making the world a better place. The fifth button will take you to the Lottery Library, where you can see everything we’ve put up for grabs in the lottery. You can check things out based on donor, whether they’re signed, how limited they are, whether they’re books, games, comics, or jewelry, and more. It’s your one-stop-shop to see what’s available. And there’s a lot available, folks.